In March 2018 issue of Stocks & Commodities, author John F. Ehlers presents two new indicators. The Recursive Median Filter ignores the spiking types of the price noise. The Recursive Median Osclillator has less lag and a faster response to the larger moves in the price data. Figure 1. 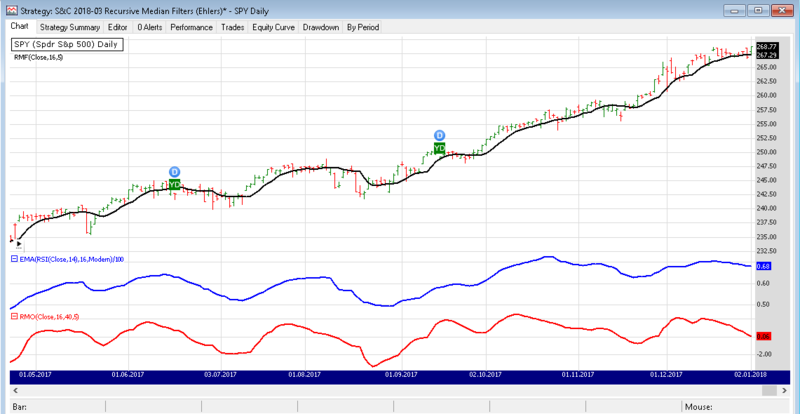 Application of the oscillators to a daily chart of SPY (SPDR S&P 500 ETF Trust). After updating our TASCIndicators library to v2018.02 (or higher), the RMF and RMO indicators could be found under the TASC Magazine Indicators group. You can plot them on the chart or use as an entry or exit condition in a Rule-based Strategy without having to program a line of code yourself.